The rocky mountains of Alberta are among the most spectacular in the world. Peyto lake drains right from the glacier (on left.) Three trips and I still seek the perfect day to shoot it. The Prince of Wales hotel in Waterton Lakes National Park, part of Waterton-Glacier International Peace Park. That's the USA at the end of the lake. Some badlands in Alberta on the way back from Drumheller. Note the rainstorm in the background. Calgary at twilight, with snowcapped rockes in the distance. The town of Banff, in the national park, at night, in early winter. The setting of the famous Banff Springs hotel, at sunrise, in winter. The Crowfoot Glacier overlook. I actually like this better in winter, with more exposed blue ice. That day the ice was mostly white. Sunrise over the mountains north of Banff. Calgary by day in midsummer. A 300 megapixel view of Lake Louise from the shore in summer. 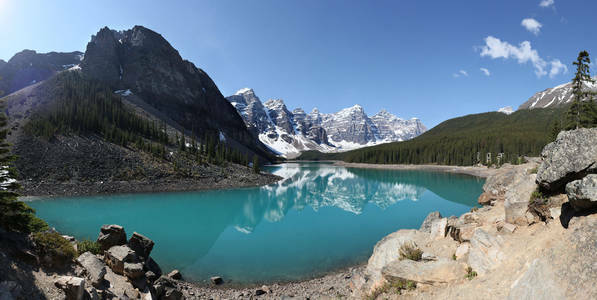 See several more in the gallery of Moraine Lake and Lake Louise panoramas. Snow covered Lake Louise from the chateau, at sunrise. A partly frozen waterfall in the Maligne canyon in Jasper National Park. This is the Athabasca river and it's source, the Athabasca Glacier to the left. The rockies over green Alberta fields. One of the waterfowl lakes along the Icefields Parkway. The Athabasca joins its north fork. Edmonton on a late fall night.